Again I wonder how we can bring together needed old and new skills and competences. What I heard the last days is not answering my question about the need for common frames for the "turns" and new ones to come. 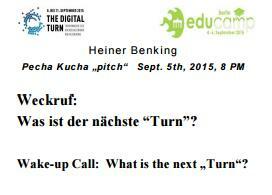 I can only repeat to revisit my slides from Saturdays Wake-Up Call: What is the next "turn"? I repeat here a selection of slides from Saturday. So maybe we start so constructive discussions on Old and New Turns and Turfs, and include the Human Dimensions requested in the opening talks today ! Needs to be edited !! In Berlin, the town of Wilhelm von Humboldt, this year’s ELIG conference is sparking a debate on how the classical education ideal of empowering the individual to lead a self-determined, active and responsible life translates into modern society. What skills are needed to become an active builder of opportunities in an increasingly interconnected world? The conference will investigate how the development of digital competences can be supported on a broader scale than today in all levels of the European education systems and investigate trends and leading examples of corresponding learning innovations from the viewpoint of educational providers as well as institutions. Die European Learning Industry Goup (ELIG) ist ein Zusammenschluss namhafter Verlage, Hochschulen und Technologieunternehmen mit dem gemeinsamen Ziel, das Lernen in Europa zu verändern. Partner der Veranstaltung sind der Stifterverband für die Deutsche Wissenschaft, das Hochschulforum Digitalisierung und die Fernuniversität Hagen.